The Centre has given its nod for the restoration and preservation of 250-year-old building, Pothimala, and its murals.A high-level team of the Archaeological Survey of India (ASI) of the Chandigarh circle led by its superintendent archaeologist VC Sharma along with members from drawing, engineering, chemist and other wings visited Pothimala this morning and carried out its physical examination. “We will send a conservation note first before preparing an estimate of funds needed for preserving Pothimala and its murals, which have developed huge cracks,” said Sharma, adding that the Prime Minister Office (PMO) had been taking interest in the restoration and preservation of this antique and historical treasure for the posterity. “To declare it a national monument or not is the prerogative of the Centre. As per the history of the building and structures, it is worth a national monument,” he claimed, adding that the work of restoration and preservation could be completed in two years. A team of the ASI, which had carried out a survey of this building a few months ago, had recommended the restoration and preservation of the same. The Centre has now initiated action on the basis of its report, which was later sent to the PMO. “Pothimala -‘pothi’ (holy book) and ‘mala’ (rosary)- belonging to Guru Nanak Dev, is lying in this building built by Guru Jiwan Mal in 1705, who was a descendant of the fourth Sikh Guru, Guru Ram Das, and was revered as Guru by a large number of people belonging to the Sodhi clan at that time. At presently, Haresh Singh Sodhi is the owner of the estate, but he has given Gurgaddi (seat of guruship) to his son Yuvraj Singh Sodhi. Haresh said the Centre had sent a team of the ASI in 1980 to preserve Pothimala, which was not done for reasons best known to the authorities. The building was in a deplorable state and and if it was not preserved now, a monument of an international importance would disappear one day. Local MLA Rana Gurmit Singh Sodhi, who made efforts to involve the Prime Minister for its conservation, said murals present in Pothimala was the best example of secularism, which existed in India centuries ago. 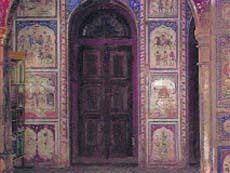 Such murals were found rare in other parts of the country, he added.